The Los Angeles Unified School District Board of Education is expected Tuesday to formally sign off on a new labor contract with the teachers’ union that ended a strike by educators spanning six school days. The contract, which calls for the hiring of more teachers, along with support staff such as nurses, counselors and librarians, has already been ratified by members of United Teachers Los Angeles. The school board vote is likely to be a mere formality. As part of the agreement, however, the board is also expected to consider a resolution pushing for a moratorium on charter schools opening within the district. 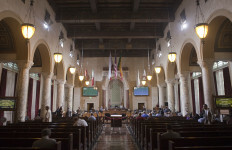 Expansion of charter schools and co-location of charters on LAUSD campuses was a major point of contention with the union. Under the contract agreement, the district is expected to support a statewide cap on charters and to provide regular reports on proposed co-locations of charter and public school campuses. Members of the advocacy group Reclaim Our Schools L.A. is planning to attend the meeting with a group of district parents “to hold the board accountable to their promise” to adopt the resolution.